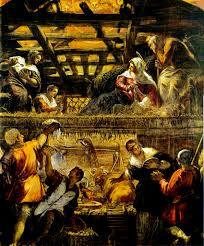 Tintoretto’s wondrous Nativity shows how, ‘The Light Of The World’ once confined to a manger within a rude stable began to bestow grace on all the surrounding world. This a dynamic painting which foreshadows the mission of redemption the tiny babe was born to accomplish. Janet Baker is an artist of the highest order. Her utter technical command and her ability to unerringly find emotional truth resulted in a legendary career garlanded with landmark recordings and never to be forgotten stage performances. Her performance of, ‘Che faro senza Euridice’ will live with me always as I make my journey through the dark wood. Well our Sleigh has travelled more than halfway now on our journey to celebrate ChristmasTide. Yesterday’s choices put me in something of a wistful contemplative mood and led to today’s selections by Chris Isaak and John Prine. Christmas is a time when we often turn our minds to reflection on the health of our relationships. Relationships with our parents, our siblings, our children and our spouses or partners. And, we remember bitterly or with rueful affection the relationships of old which are now part of our history – part of the person staring back at us in the mirror. Christmas can be a healing and nurturing time for relationships it can also be the occasion for exhausting, tearful sunderings which will sully the season for years or decades to come. As in all things some will say you get the Christmas your life through the preceding year has mapped out for you. I now present a ballad of loss and longing from the golden boy out of Stockton, California – Chris Isaak. It’s not his fault that he looks like a matinee idol and that the microphone loves him almost as much as the camera. ‘Christmas On TV’ tells the sorry tale which Isaak sings without over emoting of a bereft husband with his nose pressed to the window glass watching the Christmas celebrations of his ex-wife and her well heeled new beau. Though he’s only across the street from the happy pair (or so they seem to him) he might as well be a million miles away. It’s so easy to be all alone in the midst of the crowd as the carols play and the lights twinkle. Sometimes only fortitude, a good whiskey and a ballad in blue will get you through. Merry Christmas to the lost and the lonely, the abandoned, the abused and the outcasts. Next John Prine who sits at the top table of American songwriters leaning back in his chair with either a rueful smile or a goofy grin depending on the circumstances of the day. Prine has a glorious gift for examining the human heart and it’s myriad joys and travails with a the precision of a tender surgeon. It seems as if he has watched carefully and listened closely as he has moved through life – building up a store of experiences he can hone into humorous shaggy dog stories, touching love songs or heartbreaking tales of misspent or misshapen lives. John Prine has wisdom which he wears lightly – we can all learn a lot from leaning in when he speaks. ‘I dream of her always even when I don’t dream – her name’s on my tongue and her blood’s in my stream’. The Big House searchlight spotlights the snowflakes like dust in the sun and the prisoners aching for those they love outside the walls make do with Turkey and pistols carved out of wood. They’re all homesick waiting for eternity to release them. In the meantime nothing to do but sing up and hope the homesick blues fade away for one night at least. John Prine has a heart as big as any goddamn jail and if I’m ever in Prison it’s his songs I would sing as the doors clanged shut each night. Today’s poem, ‘The Carol Of The Poor Children’ is by Richard Middleton. On this night of all nights, when in the frosty sky A new star, a kind star is shining on high!’. This entry was posted in Christmas, classic Pop, Classical Music, Folk Music, Music and tagged Che faro Euridice, Chris Isaak, Christmas in Prison, Christmas On TV, Janet Baker, John Prine, Richard Middleton, The Carol Of The poor Children, Tintoretto by Thom Hickey. Bookmark the permalink. Merry Xmas (a tad late) Thom and a wonderful New Year. Thanks. Hoping we will all have a fulfilling 2017 Thom. If you had to spend Christmas in Prison the inmates better brush up on their IT skills to tune into the blog – Prine a master storyteller & no one sets a mood or scene more adroitly in the first few lines. JP a master craftsman of song.